A face with slight frown, closed eyes and drop of cold sweat. Things are not good. The stress has become too much and has lead to full blown diaphoresis. This emoji is in desperate need of medical attention. Very worried. Anxious, clammy hands or skin. Cold sweat. 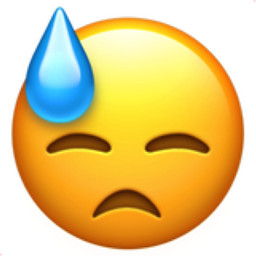 iEmoji old name: Crying (incorrect). Crying face with tear drop.